An RPG foreign to the PC in every way, and a port that does little to modernize it. Theres fun to be had, but only for the open-minded. It takes chutzpah to port a 24-year-old console game to the PC. You're crossing the great divide, bringing mechanics and design ideas from one world to another while hoping that they translate. I'm typically all for it, as long as it's reasoned—we can learn a lot from the past. Square Enix's port of Final Fantasy 3 teaches us that console RPGs were largely about patience, and often about thinking outside of the box. It also shows us just how far we've come, and that some things are better left in the history books. Here's your setup: Four orphaned children discover that they're secretly heroes of the light crystals, and set off from their hometown on an adventure to save the world. Along the way, they face monsters, learn magic and kung-fu, and pilot a boat that flies. It's basically every child's dream life. It's also unbelievably tedious. Battles happen at random as you travel through the world, and you'll be spamming the Enter key to mass-attack enemies and skip through menu options. 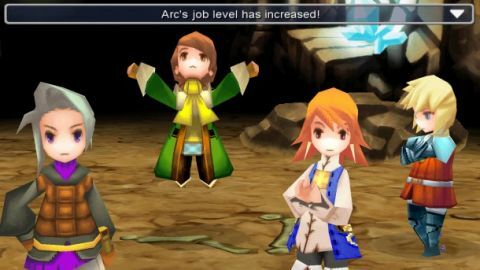 You'll have to fight a lot: FF3's Job system lets you change classes on the fly, but you'll need to level each job to unlock its full potential. I like the flexibility of switching my meatshields into damage-dealing casters and love that spells can be equipped and swapped with ease, but FF3 often forces you to fail a boss fight or situation before you realize you need to mix up your party. Once mixed, you'll have to go level up your jobs and then try again. Modern RPGs are about class mastery, where FF3 wants you to diversify your skill set. That's a neat idea, but it means a lot of trial-and-error, grinding, and micromanaging my party. Square's port is based on the Nintendo DS version released in 2006, which was a huge graphical update of the 1990 NES original. It reworked the introductory hours to add a more modern narrative throughline, gave the previously basic heroes more distinctive personalities, and put the whole thing in a 3D world. Sadly, this PC release looks every bit like an early 3D handheld game: blocky polygons, low-res textures, dull fonts. You'll control your party with a gamepad or keyboard, and while keys can be remapped, it still feels like I'm playing it through an emulator. Hold the Z key and to zoom into the world, looking for sparkly hidden items, for instance. That makes a lot of sense on a small handheld screen, but none on a 1440p display. Make sure to use the game's three save slots when outside of dungeons, as the quicksave option only lasts through one load before being erased. This is a handheld game, after all. All that is frustrating, but 10 hours into the game I'd bought into the inherent charm of FF3. Its story doesn't surprise outside of one world-changing reveal, but I could still be caught thinking about the next dungeon while away from my desk. The longer I played, the more forgiving I was of the port quality—which is either a form of JRPG Stockholm Syndrome or a willingness to find fun in frustration. FF3 is unforgiving of even small mistakes, but once you learn how the system works, there's joy to be had in optimizing it. It's hard to recommend Final Fantasy 3 in 2014, especially at the $16/£11 price Square's asking. It's a nostalgia trip that still feels more suited to a handheld than a desk. If you've played it in the past, you know how long this fantasy can last—more than 50 hours, if you want to finish everything. If you haven't played, you'll have to look past many antiquated concepts to find the fun. Those open to outdated gameplay could find something fascinating here, but modern role-players should stay away.